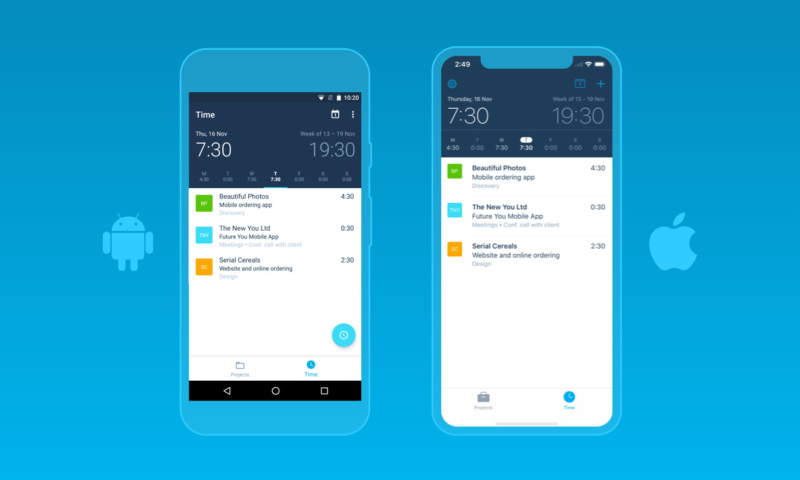 Xero Projects for iOS and Android has just dropped! A lot of small businesses would agree that tracking time and expenses on jobs is an ongoing task that does not stop when you leave your desk. If you’re in the business of providing a service you are likely to offer up your time and expertise to clients anywhere, throughout the day. Whether over the phone, via email or in person,any time spent on one client’s job is less time spent on something else, and is therefore a cost to you – one that can easily be missed if you’re relying on spreadsheets, notebooks or even scraps of paper. The same applies to your staff, so it makes good sense to arm them with the tools they need right inside the devices they carry every day. Here is where the Projects mobile app comes in. Xero’s newest tool is now available on-the-go on your iPhone, iPad or Android device. Xero Projects is the simple way to track the time and money you spend on each job, allowing you to focus on the right work, improve efficiency and drive profitability. With the Projects mobile app, you can add a project as soon as you start it, from wherever you may be. That means you can stay on top of your project expenses as they come in, and record your time as you go about your business. For users who just need to track their time, the timesheet view is ideal. This view shows only your time entries along with your total hours for a particular day and week. The Xero Projects mobile apps use touch ID for login so your staff can jump in and out without breaking their workflow and without having to login into Xero. Projects on mobile is always up to date with your Xero organisation so your business isn’t dealing with mismatched records or forgotten time. And, because it’s one record in the cloud you can see how your projects are tracking in real time. With Xero Projects you and your staff can truly work from anywhere. Our goal with the Projects app is to take the pain out of time tracking and help you stay on top of your project financials, so that you can make informed decisions and manage your business anywhere. Xero Projects on mobile works with Xero Projects in the desktop app so you’ll need to have a Xero organisation with Projects enabled. Add the users you wish to have access to projects and then you’re ready to go mobile. From here, you and your staff can download the app directly from the Apple App Store (for iOS) or Google Play Store (for Android). Login with your Xero credentials and you’re good to go. Forget the fiddly spreadsheets, Post It notes and missed opportunities that come with not recording your jobs and projects effectively. Get Xero Projects on mobile today and begin to see how you can drive the profitability for your business. The post Xero Projects for iOS and Android has just dropped! appeared first on Xero Blog.